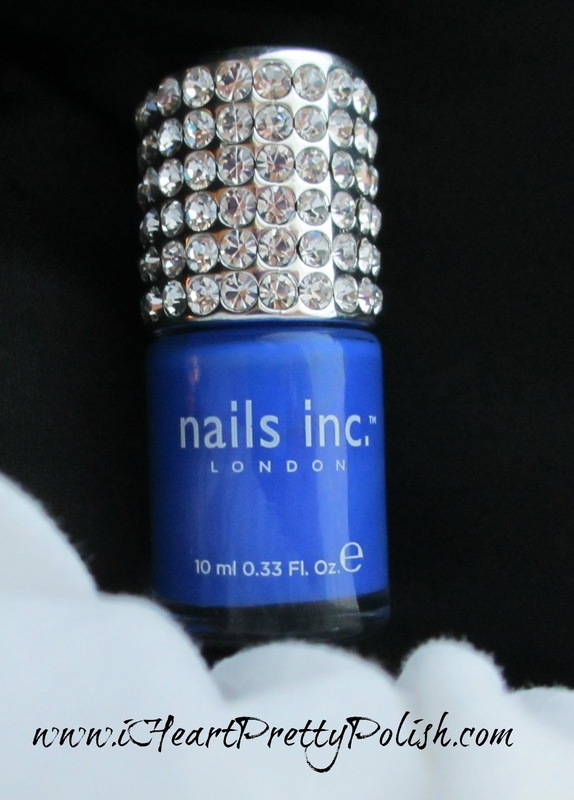 This is the famous Nails Inc. Baker Street. I ended up picking this up when I purchased NARS Storm Bird on Sephora's website. In order to get free shipping, my order had to be $25 or more. I'd rather spend my money on nail polish than shipping charges. I went to the sale section and this was on sale for $10. Of course, the bottle is really cool and I do like blues, so I added it to my order. I'm sorry to say, but the best thing about this polish is the bottle. It's more of a novelty item in my eyes. The blue is just so flat and blah. I have other blues that are close to this such as Ulta Blue Streak and Ulta Moody Blues (see my guest post here), but they have more depth. This is such an artificial blue that doesn't look good on me. I tried to liven it up a bit by adding NARS Storm Bird as an accent nail, and it didn't help. It just wasn't flattering on me. I liked the shade of blue on me and the finish of it (I'm a sucker for a good crelly). I agree with your coloring though it doesn't look the same on you as others. I like it, but most of my bases are used for layering anyway, lol. I have this on my wishlist because everyone always swoons over it. I like it, but it's not "amazing." lol. I heard Essie Butler Please is a dupe. Maybe I'll just pick up that instead. Great post! I love this famous shade. I am sad you didn't like it so much, but I have to admit I am enjoying seeing it on your nails! I adore that bottle too, it is pretty enough to keep just for that alone! Yes, the bottle is pretty awesome. I sure wish I liked it more. I'm not too picky so it was weird that I didn't like it... oh well - ya win some, you lose some. I bought it for the same reason! Lol. I haven't tried it yet. I figure, 98% of the time polishes are sitting in their bottle on my shelf rather than being on my nails, so with a cute bottle this one is worth keeping. yes, great way to think about it. The bottle is pretty awesome! It's too bad that you didn't like it more. I love Baker Street but I know that feeling with popular polishes, that you feel like you should like them more than you do. I know. And seriously, I'm not that picky. Maybe I was just crabby and it caught me on the wrong day??? 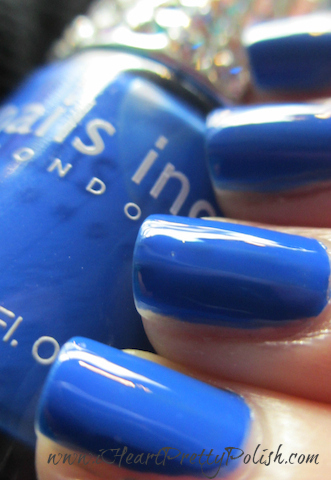 This is such a gorgeous blue! I love it! Sorry this didn't work out for you, I've had it on my wish list for awhile now. I know how you feel though, I have several polishes that are popular that don't do anything for me. For instance, Layla Mirror Effects, looks so horrrble on me I've decided is only good as a base for layering or stamping. I wanted to love it, just can't! It's crazy how polish can look so different on different people. Of course, I'm sure skin tone has a lot to do with it....and personal preference. Aww, I'm sorry you didn't like it. I totally have the Blues!!! I love all shades. 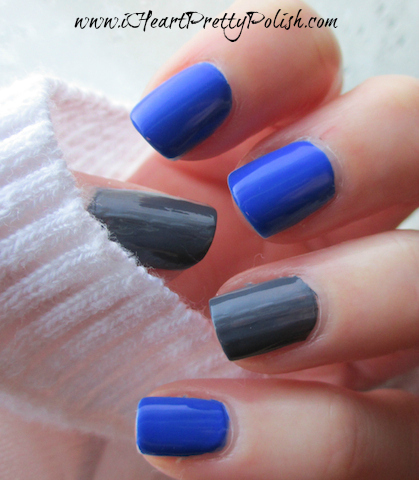 Actually tomorrow, I am swatching Essie's Butler Please for Hump Day Mani. I like Baker street I think it is pretty. I love blues too. And maybe I was crabby that day. I'll keep trying. I have heard Butler Please is a dupe - I hope you like it! Aww, I don't know, Essie, it looks really pretty on you! But it's OK if you're not feelin' it. Ah thanks. Maybe I'll try it again....maybe this summer!